If you don’t put a date on your goal, what kind of goal is that? How do you make sure you don’t spend too long on accomplishing a goal? How do you make sure you are not unrealistic when you set a due date for a goal? The only way you can find out is by setting an exact date of accomplishment for the goal in the first place. If you set a date you have an orientation, something you can alter during your execution towards the goal. A due date is a tool that helps you move forward with your goal-achievement. The date does not have to be the day when you accomplish it — especially when you are none to little experienced with achieving goals. The date is helpful for the inexperienced person to take a step, another step and another. Thoses steps (your movement) are essential because only when you move you can alter the way. For example: Only when you express your opinion (written down for yourself or shared with a friend) are you able to change your mind and adjust your opinion. Starting to move, starting to express, starting something is like setting a status quo, a standpoint from which you can go. Only when you know where you are, can you tell where you want to go or whether you are already where you wanted to be. So, be aware of your point of view and the current state of your goal-accomplishment — in the beginning of goal-pursuing and during the journey. To sum it up, depending on your experience in estimating how long it takes for you to achieve XYZ, the date (for example: May 1, 2017) is either your precise day of completion (mission accomplished!) or an orientation with plus/minux X days. The more experienced you are the better you will be able to estimate the time it will take, the amount of work it will take you and the exact steps necessary to reach the goal. Also, the more specific your goal, the more likely it is for you to reach it. 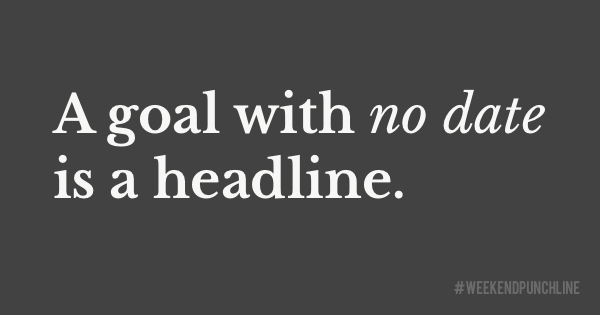 Your goal needs to be super specific so that it is crystal-clear for you when you look at it. The more vague you are the more you can allow lack of motivation, lack of orientation (direction) and lack of execution. Make $US 1,000 in January 2017. Make $US 1,000 until January 31, 2017 (through selling things I don’t need anymore). Do you see how an exact due date makes the goal more tangible and puts you into a position of duty? Now you have responsiblity, no more room for being vague. Notice also the precise way of making these 1,000 Dollars I wrote in brackets. That is optional. I added it because it should enable you to take focused and goal-centered action. When you know you want to sell the stuff of your household you don’t need anymore and earn 1,000 Dollars through it, this is precise and even instructive. That’s a goal. A goal is specific, has a due date and is optionally instructive so you take action for sure. Short form formula: Goal = specific + date + optionally instructive. What is your goal? Write down your goal using the formula. Feel free to write it for yourself or share it with me (if you feel comfortable doing so). This was episode 8 of the #weekendpunchline . Every Saturday and Sunday.